The countries of Central Europe -- especially the ones that were part of the Communist bloc -- don't attract the foodie kind as much. It's not surprising, since communism did serious damage to all kind of culture, including gastronomy. But Prague's culinary culture is just beginning to find its wheels again. PRAGUE, Czech Republic. Foodie travellers -- the brand new fashionable term for gourmands who like to spend time on the road -- like to stop and eat pretty much everywhere in Western Europe. Barcelona, Paris, Rome, Copenhagen, so many great destinations for foodies. But for the countries of Central Europe -- especially the ones that were part of the Communist bloc -- don't attract the foodie kind as much. It's not surprising, since communism did serious damage to all kind of culture, including gastronomy. Prague's culinary culture is just beginning to find its wheels again. I almost always start my foodie guides with lunch. I have to admit: I almost never have breakfast. A strong coffee and I'm ready to go. So here's a couple of lunch addresses! Terasa U Zlate Studne is on the rooftop of a historical hotel called the Golden Well, which traces its origins back to the 1500's. The menu is built accordingly, since it includes "the mandatories," the "crowd-pleasers," including a beef carpaccio. To end the evening with style and discover a place where the concept and the alcoholic beverages are both amusing and unique, you need to head to AnonymouS bar. It's a flair bartending bar and the dark atmosphere is truly enchanting! Click here to view my video shot on-site. The morning is the ideal time to visit Prague's mandatory sights. 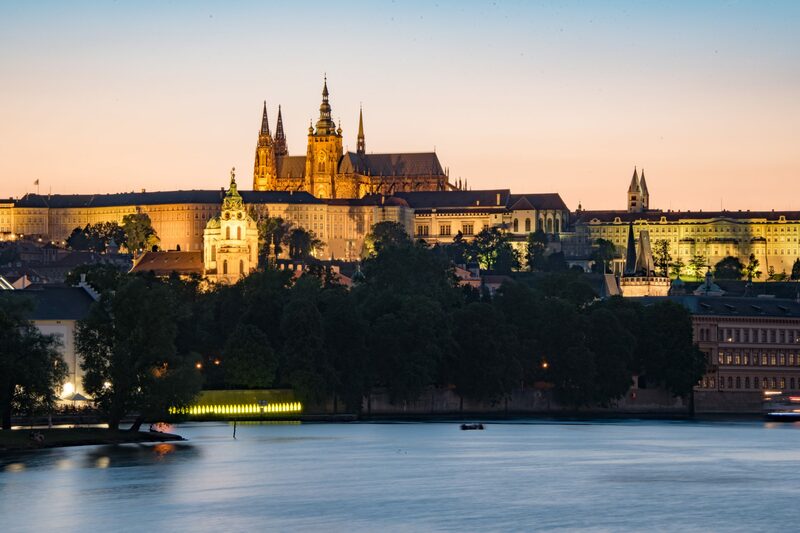 The Old Square, Charles bridge, the Prague Castle and Tancici Dum are on everyone's list! And in the same history-laden vein, our lunch stop is another place that should be on all lists : Cafe Imperial. It's a historical café that has seen it all, from nazis to Soviets to the fall of the Communist regime. Café Imperial is now back to the look of its glory days. There are several different menus available, however the classic Czech dishes - grandmother food, if you will - hold an important place at Café Imperal. Try the kulajda, it's unique! Prague's suburbs are never part of the tourist trail. And when we think about Prague, we don't really think about microbreweries, since they have such well-known brews. So I suggest we take a stop off the proverbial beaten path. Ideally, this trip would be a beautiful bike ride towards the countryside - though the trip is easily done by bus - with, as its ultimate stop, the Uneticky Pivovar microbrewery, which brews a few beers and serves them in its wonderful, rustic restaurant. Na zdraví! V Zatisi claims to have had been the first gastronomical restaurant to have opened its doors after the end of Communism. The decor is a mix of glam and nouveau gothic and the dishes are simple but well executed. They even have an Indian menu. That'll get anyone's curiosity going! Thanks to JayWay Travel for hosting C&C in Prague! If you need help to plan your trip anywhere in Central Europe, they're the ones you need! In this series, Cédric Lizotte visits some of Europe's best restaurants. On his blog, Continents & Condiments, he shares his inside knowledge about the best places to sample the delights of some of the best chefs on the planet. Follow his gastronomical journey on social media with the hashtag #CedricInEurope.